From His Head to His Heart to His Hands, the 3 CD/1 DVD anthology features released and unreleased gems from solo sessions to live performances from The Fillmore East and Fillmore West, The Bottom Line and other historic venues. This compilation also will feature a fascinating new mini-documentary combining vintage audio interviews with Bloomfield and live performances with new reflections from his friends, collaborators and admirers. 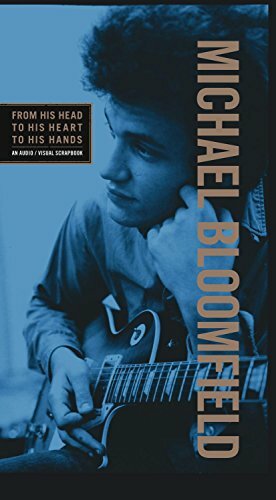 Guitarist Mike Bloomfield never fully got his due as one of the go-to sidemen of his generation or for his importance as a common thread in the patchwork of genres that changed the face of rock and roll in the 1960s and 1970s - until now. Bloomfield's incredible career will be chronicled in From His Head to His Heart to His Hands. Raised on the North Side of Chicago, Bloomfield's guitar prowess was immediately obvious; emulating the architects of the genre and fusing their style to the more experimental strains of 1960s pop and rock. Legendary A&R man John Hammond saw the same sort of raw talent in him that he saw in some of his greatest discoveries, from Bob Dylan to Bruce Springsteen, and would sign Bloomfield to Columbia Records. Bloomfield would make history for the label as a session guitarist for Dylan's iconic Highway 61 Revisited in 1965, featuring the incendiary "Like a Rolling Stone." Bloomfield was an original member of The Paul Butterfield Blues Band, contributing to their 1965 self-titled debut and follow-up East-West (1966); the latter album s title track, co-written by Bloomfield, is regarded as a high watermark in rock history, combining elements of blues, jazz, psychedelia and Eastern musical concepts in equal measure. From there, Bloomfield founded the famed "American Music Band" The Electric Flag, and fronted it into 1968. Also in 1968, Mike partook in the recording of Moby Grape's Grape Jam and the platinum-selling Super Session LP, a collaboration with fellow session legend Al Kooper. As the decade wore on, Bloomfield would continue to release innovative, guitar-heavy works, including his debut solo album It's Not Killing Me and My Labors with Electric Flag member Nick Gravenites, both released in 1969. The remainder of his career was perhaps best known for more session highlights, including work on Muddy Waters Fathers And Sons and Janis Joplin's solo debut I Got Dem Ol' Kozmic Blues Again Mama! - all the while recording a series of highly-regarded solo works. Bloomfield died at the too-young age of 37; only afterward did his reputation solidify as a building block of the 1960s' popular music evolution, his peerless guitar work one of the few common threads in a decade of musical change. At long last, Bloomfield will truly get his due with From His Head to His Heart to His Hands. A Ravin' Film. Directed by Bob Sarles. Produced and Edited by Bob Sarles and Christina Keating. Director of photography: Ted Leyhe. Producers: Ted Leyhe, Larry Milburn & Bruce Schmiechen.